If you are a news junkie, you will thrive off news this month and will perhaps be addicted to various online news sites or forums. It is not just about reading the news, you want to discuss, debate, and analyse it – you want to know what it means for you. You can get to the point, however, where you find it hard to switch off. New interests can take over your life, but this can fill a gap and add more spice to your life. This month is one where you will tend to run away either mentally or physically from things which you are unwilling or unable to deal with. Sometimes, avoidance is a strategy – often when you avoid things you have time to approach them from a new angle, and that can be very beneficial. This is a restless period for you; however, you are more adaptable and open than usual, and that can have a positive impact on your social and business life as you will embrace opportunities that you would normally see as ‘out there’ or risky. Overtiredness and mental fatigue can lead to depression this month. You need to get enough sleep as the downside of all the activity in March is excitement that can morph into stress which can leave you a little depleted. Depression right now should not be overestimated – it is not about your life or being unhappy, it is about being overworked and not having a balance between rest and mental activity. There is often an interest in the metaphysical and outer world; when it comes to life, Capricorns are looking for answers, and while the more kooky ideas will not appeal to you, you will be open to discovering what dream interpretation or hypnotherapy can do for you and your understanding. Capricorn are prone to analysing relationships and emotions this month. You are in the mood to look for linkages, meanings, and patterns, and your need to find these may mean you make connections where there are none and end up with the wrong conclusion. You are likely to screen and filter your feelings and block your more impulsive side. 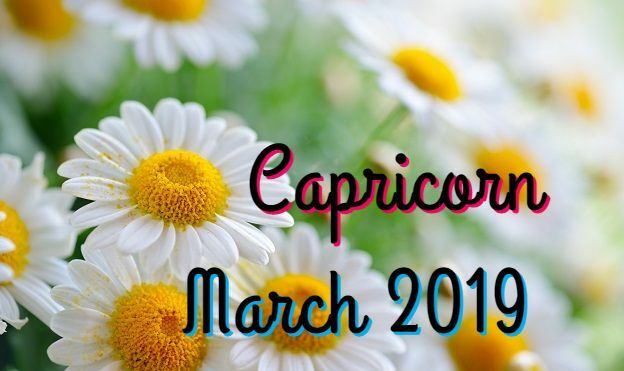 It is like you want to side with your head at the expense of your heart, and this can ruin the ambiance in relationships that you established during Jan and Feb. Come on Capricorn; you do not need your feelings on the leash, let your hair down, and don’t analyse it all to death. I think that Capricorns are a little disconcerted by the intensity of emotion they are feeling; this is why you are suddenly backing off a little and shutting down, almost as if things were going too fast. But you had better get used to this level of passion as it is here to stay, and you should enjoy it. Capricorns should seek to get involved in pleasurable activities with their partner to take the pressure off and to have a mental rest – you are stressing out with mental activities and so love life should be a haven away from the rat race and a section of your life where you relax and put their brakes on the thoughts. This month is wonderful for study, exams, and other activities which require you to be intellectually astute and mentally active. It is a time when you feel confident in your ability to debate, present speeches or do public speaking. It is great for doing interviews or auditions, and in general, you can give a very good account of yourself. This is a very good month for raising awareness – so if your work involves activism or you want to get those you work with fired up about the issues, this month will be productive. It is also great for public awareness campaigns like stop smoking, eat less sugar or the promotion of tolerance. March is really an ideal time to learn a new language or improve your communication skills by doing something like elocution, voice projection training, coaching regarding connecting with an audience and selling an idea. You can improve interpersonal skills, telephone manner, and persuasive techniques by attending online seminars. The point is that learning techniques that can change your life (from social media based businesses to blogging) is at your fingertips and maybe just as far away as a click on a Facebook advert. March is very effective for those of you who communicate using non-verbal methods from dance to cartoons to art. You will find added ways to inject your work with relevance, especially when it comes to satire.